A first-time mom's take on being back on the job after maternity leave. Q: How did you feel about returning to work after your maternity leave? 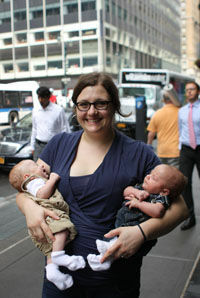 Jennifer Ernst Beaudry: It really started to sink in that my maternity leave would end when the boys were 2-months-old. I had mixed feelings: I was excited to see my co-workers and get back into the swing of things work-wise. But I had a blast hanging out with the guys over my maternity leave, and at 2 months old, they were beginning to be fun: sleeping more, smiling and wiggling. After the chaotic blur of the first weeks, we had settled into a routine, and it didn't seem possible my leave could be over just as it was seemingly beginning. Q: How did you prepare to go back to work? A: I had a running list of errands, tasks and things I wanted to get done before my leave was over: big things like settle on child care and small things like bake some muffins, so I tried to get as many things checked off as I could. The main things I knew I needed to get ironed out before I started back were to get our child care situation finalized, buy some transitional clothes to accommodate pumping at work (and, to be honest, my still one-size-up figure) and get our closets organized. Q: How did the morning of your first day back go? A: I set the alarm an extra 45 minutes early, just in case, and I had prepped all my supplies (pump, equipment, lunch packed, clothes laid out). It was hard to leave the boys, but after I caught the train (and, not going to lie, wiped a few tears) it felt very normal to be back. And I wasn't nearly as tired as I expected: the guys gave us their at-the-time longest-ever stretch of sleep that night—seven hours! Q: Who takes care of the boys when you are at work? A: This month, I'm working three days a week, and my husband, Nate, is taking care of the boys on the days I'm at work. Next month, after some deliberation, they'll start at day care. Nate works in retail with the irregular schedule that comes with it, so planning pickup and drop off is going to be a challenge. Q: Now that you're a mom, do you approach work differently? A: I have a new appreciation for the actual work I do having been away for three months. But the hours question is tough: I used to work 10 a.m. to 6 p.m., or more realistically 7 p.m. or 8 p.m., but that schedule just isn't compatible with day care—or with being around for the nighttime routine, which is important to me. I'm planning on working 9-to-5 whenever possible. Frankly, balancing the hours (both the number of hours per week and the actual hours in the day) is what I'm expecting to be the trickiest part. Q: What has been the most challenging about returning to work? A: It's hard being away from the guys, obviously. But I think the first hurdle to cross will be purely logistical: How can I make the train and still file the stories that I need to file? How can I schedule all the calls, appointments and meetings I need to make around pumping? (There are two other mothers using the pumping room, so taking their schedules into account has to come into it, too.) How can I get the boys to or from day care and myself to work in one piece? What's becoming clear is how deliberate I'm going to need to be about my time and how I use it to serve the needs of my job and my co-workers, as well as my family. Q: What has been easier than you expected about returning to work? A: I was surprised at how easy it felt to pick up the reins after three months away—easier, even, than a two-week vacation. It's almost like starting with a clean slate: no loose ends to tie up, emails or calls I really should have returned before this, no stories overdue. How often do you get to start from scratch with a job without the learning curve of a new position? Q: Are you leaning on anyone in particular for support as you make this transition—your husband, a new mom friend, or co-workers? A: All of the above. My husband rearranged his schedule to make this month work. My co-workers and managers didn't bat an eye at the months I needed to work at home and picked up my duties while I was out. And all my friends with kids—those who work outside the home and those who don't—who were and are sounding boards for ideas, perspectives and tips to how they make their own lives flow.